It was just three weeks ago that The Legal Genealogist was there. Speaking at the East Baton Rouge Parish Library. Having dinner at the same Poor Boy Lloyd’s where President Obama stopped in on his trip to Baton Rouge — and for the same kind of po-boy. Admiring the gorgeous homes and historic districts. 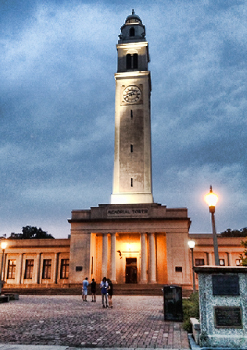 And now… and now… have you seen those images out of Baton Rouge? Out of so many parts of Louisiana? Out of the depths of a flood zone that’s looking a lot like what Hurricane Katrina did to Louisiana? All of us, any of us, no matter how far away we may live, we can all take a minute to help the folks whose lives have been utterly disrupted by the forces of nature. Those whose family history has run into a speed bump the likes of which most of us will — thank heavens!! — never encounter. Those who need our help just to preserve a little bit of their family history. First of all, even if you’re relatively local, do not just go to Baton Rouge. State officials still want folks to stay off the roads and keep them clear for local first responders. Instead, choose to donate through one of the online sites or one of the locations outside of the flood zone in Louisiana that can get supplies where they’re needed without disrupting the flow. The New Orleans Times-Picayune has a great listing of online sites where we can all pitch in with a few dollars. Check it out here: Here’s how to help Louisiana flood victims. It also has a special list for those who want to focus on pets and animals. Check out How to help pets, other animals affected by Louisiana flooding. If you are local, these two pages also have locations outside the flood zone where you can drop off supplies that are on the needed list. If you’re not, then a cash contribution is the way to go. And WAFB in Baton Rouge has lots of links to help as well: Ways to volunteer, provide donations for flood victims. Even a little will help. Thanks. As a New Orleans native… I appreciate folks publicizing what’s happening upriver in Baton Rouge. And Poor Boy Lloyd’s is the real deal. Fingers, toes and everything else crossed for folks in Louisiana — and oh yeah… Poor Boy Lloyd’s is soooooo good.